Metro Solid Shelf Accessories include, 8″ dividers, which enable you to compartmentalize shelves and keep shelf contents orderly. Additionally, 4″ shelf ledges attach to shelf edges and prevent product from falling off. 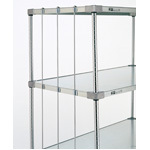 Furthermore, rod and tab kits help enclose shelf ends and backs. If you need to store totes or trays, under shelf slides keep them secure. Because footplates screw into the bottom of the post, they keep your shelves stable and can be bolted to the floor. Post clamps connect adjoining units together. Floor glides cover the leveling bolt and protect your floor. Metro Shelf ledges can be used for autoclave or cart-washable applications. Spring-clip tabs included for attachment. Available in 14″, 18″, 21″, 24″, 30″, 36″ 42″, 48″ and 60″ lengths (355, 457, 530, 610, 760, 910, 1066, 1219, 1524 mm) to fit shelf lengths or depths. Metro Solid Shelf Accessories include, 8" dividers, which enable you to compartmentalize shelves and keep shelf contents orderly. Additionally, 4" shelf ledges attach to shelf edges and prevent product from falling off. Furthermore, rod and tab kits help enclose shelf ends and backs. If you need to store totes or trays, under shelf slides keep them secure. Because footplates screw into the bottom of the post, they keep your shelves stable and can be bolted to the floor. Post clamps connect adjoining units together. Floor glides cover the leveling bolt and protect your floor. Metro Shelf ledges can be used for autoclave or cart-washable applications. Spring-clip tabs included for attachment. Available in 14″, 18″, 21″, 24″, 30″, 36″ 42″, 48″ and 60″ lengths (355, 457, 530, 610, 760, 910, 1066, 1219, 1524 mm) to fit shelf lengths or depths.